Chris Griscom has long been recognized as a spiritual leader and visionary of truly global stature. Her great love for the earth and its peoples has inspired her to travel the world, reminding us all of the sacredness of life. Her teachings about connecting with our Divine Essence and Expanded Consciousness are encapsulated in her many renowned books and tapes. 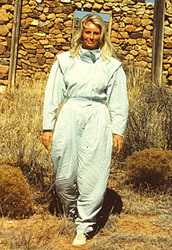 Chris established The Light Institute in the ancient, pastoral village of Galisteo in 1985. The Light Institute swiftly earned it's present-day reputation as a ground breaking spiritual center for phenomenal work in facilitating spiritual growth and healing. Ms. Griscom's innate wisdom, as well as decades of spiritual work and her compassion for the health and vitality of people's souls has made her the preeminent leader in Spiritual Healing and Multi-Incarnational exploration. Chris Griscom’s work has inspired and touched people across the globe. Chris was instrumental in the passing of the Peace Memorial for the State of New Mexico in 2003. In July of 2002, she was nominated for the prestigious Templeton Prize for Progress in Religion Award by a United States Congressman and Senator. Her humanitarian services and contributions in holistic health and education have been twice recognized by The Indian Board of Alternative Medicines, based in Calcutta, India. The Board awarded Ms. Griscom with the Sewa Chakra Award on December 2, 1996. Past recipients of the award include the late Mother Teresa and the Dalai Lama. Ms. Griscom again traveled to Calcutta, India on December 1, 1999 to receive the Lifetime Achievement award from the Board.